Tatiana Jimenez left her native Guatemala seven years ago to escape an abusive relationship and begin a new life in America. But she endured a different kind of abuse after she arrived in Washington, D.C., and sought legal help on her immigration status. With little knowledge of the system, she turned to an unscrupulous lawyer who had her sign a contract to pay $2,800 and charged her hundreds of dollars for immigration documents the federal government provides for free. Several months later — after a series of canceled appointments from her lawyer — Jimenez sought help from an immigrant advocacy group that reviewed the matter and confirmed her suspicions: She had been duped. She discovered a front-desk receptionist had been left in charge of her paperwork, and little, if any, progress had been made on her case. “They assured me this wasn’t the way things are, that I wasn’t filling out the right documents and the amount of money (I paid) wasn’t right, either,” Jimenez said, breaking down in tears. Such deception has long existed and often flies under the radar of authorities. Congress might address the issue as part of proposed immigration reforms that could expand protections against con-artists offering help to those seeking citizenship. “This is a foreseeable problem,” said Rep. Bill Foster, D-Illinois, who introduced a bill that calls for a fine and up to 10 to 15 years in federal prison for fraudulently offering immigration legal services. There is no federal statute that specifically addresses the unauthorized practice of immigration law, though the U.S. Department of Justice said federal authorities are able to prosecute using other statutes. Experts say putting a specific federal law on the books would be an effective deterrent in places where local authorities don’t have the resources to handle the extra workload. They say non-lawyers who attempt to handle complex cases can ruin the singular opportunity an immigrant has for immigration benefits, and, in the worst cases, they can get their clients deported. “Many of these people are non-lawyers — or notaries — who just kind of come out of the woodwork at a time when it seems convenient,” said Doug Stump, president of the American Immigration Lawyers Association. Nonprofit groups that aid immigrants find legal help say the problem is made worse because the nonprofits don’t have the resources to help everyone. And those who are turned away because they don’t qualify for certain programs often find notaries willing to offer promises they can’t keep. 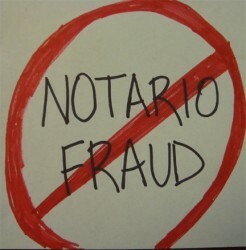 A federal database alerts state authorities about crooked attorneys or non-lawyers who advertise themselves as notarios — the Spanish word for notary public that in Latin America implies an authorization to practice law. Some states go after such suspects using consumer laws. The Federal Trade Commission started keeping track of such complaints in 2006. The FTC’s database has nearly 3,000 complaints — but experts and federal officials agree the scope of the problem is much bigger. FTC lawyer Michael Waller said many cases go unreported because immigrants living illegally in the U.S. fear legal repercussions if they report the fraud to authorities. Since 2002, the Texas attorney general’s office has used state consumer laws to shut down more than 75 businesses that unlawfully provided immigration services. Other border states, such as California, Arizona and New Mexico, use similar laws to crack down. One of their targets was Elias Bermudez, a tax preparer who has been ordered at least twice to stop offering immigration services to clients because he wasn’t certified to do so. In 2009, a county judge in Arizona ordered him to halt the practice after clients alleged they paid thousands of dollars for services they never received. He moved to New Mexico last year but was soon shut down by the state attorney general there. Bermudez defended the services he provided his clients and said the proposal to expand the federal government’s enforcement role would be a “disservice” to the immigrant community. Besides criminalizing notario fraud, Foster’s bill would allow immigrants who were deported because of unscrupulous lawyers to re-file their immigration cases. It also calls for U.S. Citizenship and Immigration Services to create grants for reputable organizations to provide legal services to immigrants.